January | 2013 | Welcome to the world of NECCO! 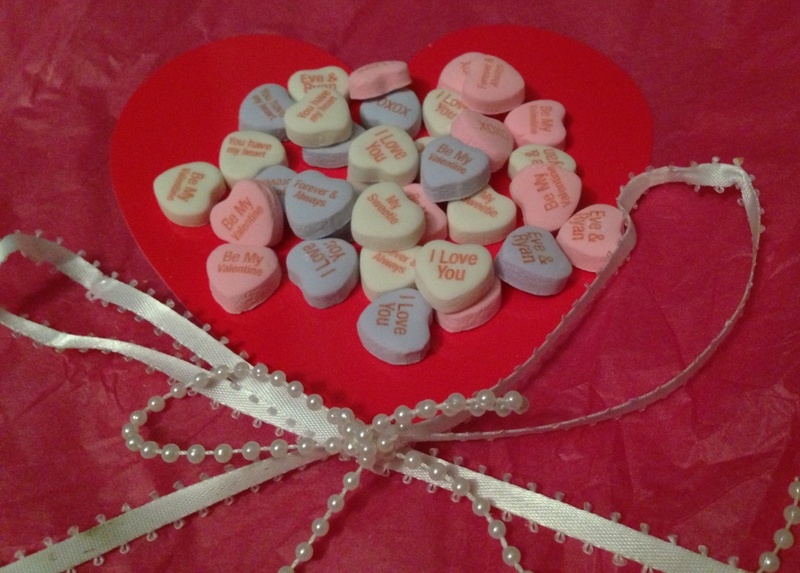 Last Day for Valentine’s Day Personalized Sweethearts Orders! 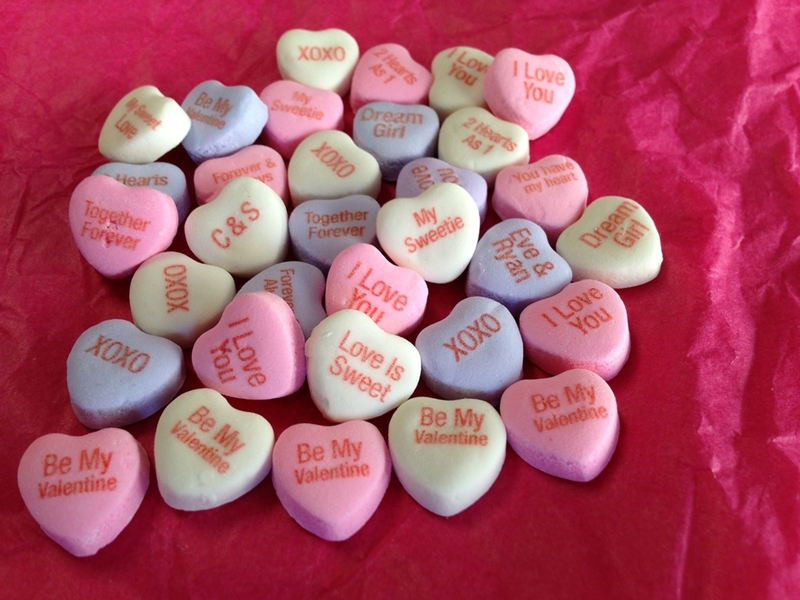 Today, Thursday 1/31, marks the final day to get your order in for personalized Sweethearts or NECCO Wafers at MyNecco.com in order for shipment in time for Valentine’s Day! 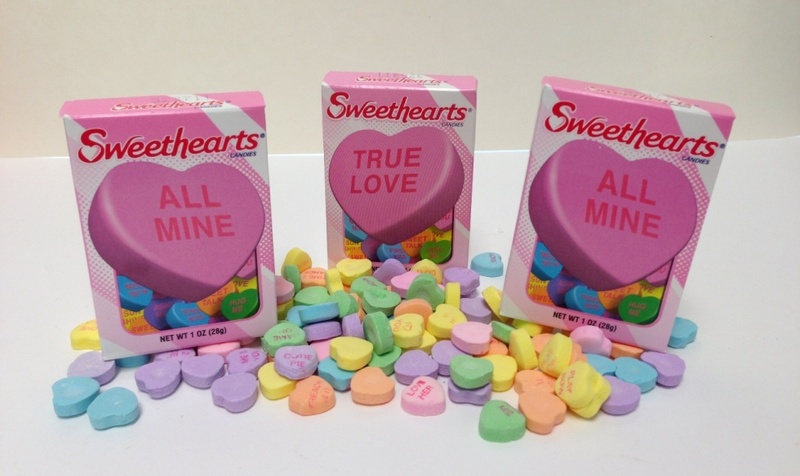 Select your candy type (either Sweethearts or NECCO Wafers). Select the colors you want. Enter in your personalized message on the template. Select your quantity and place the order! Imagine your phrase, name, date, or other personal message on a Sweetheart! It’ll be a touching gift that shows your special someone how important they are to you! Be sure to get your order in on time and get ready for an unforgettable Valentine’s Day with your sweetie! 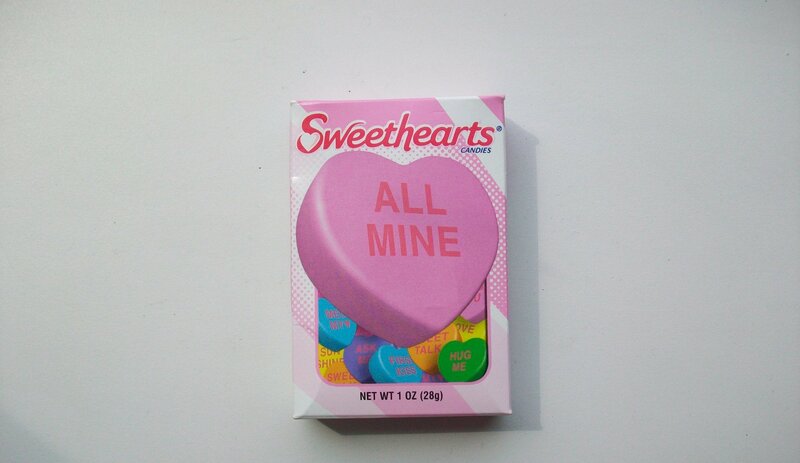 Categories: MyNECCO, Valentine's Day | Tags: candy, conversation hearts, custom candy, favors, food, gifting, gifts, holidays, love, MyNecco, NECCO, new england confectionery company, personalize, personalized, relationship, shopping, style, Sweethearts, sweetie, Valentine, Valentine's Day | Permalink. During this loving season, many of us are looking for treats to make our celebration with our loved ones extra special. 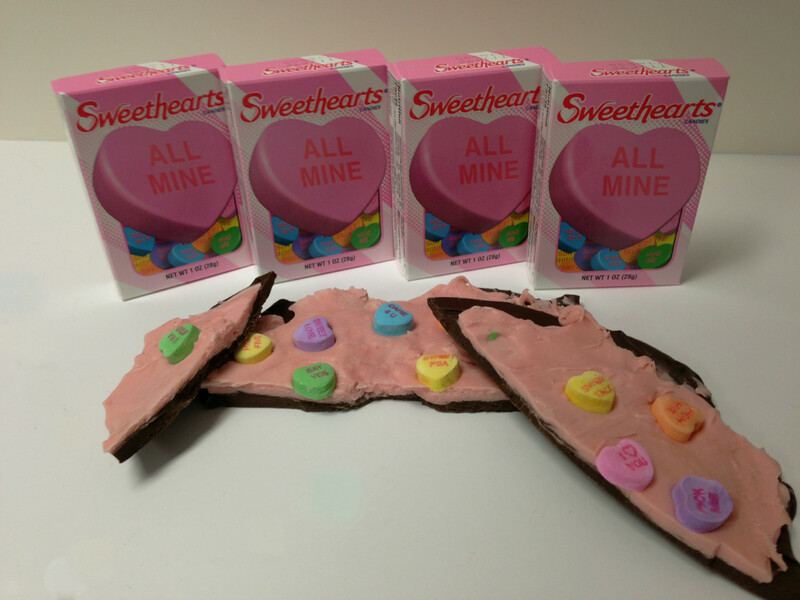 With a quick and easy no-bake recipe, Sweethearts Bark will satisfy both the sugar and chocolate lover! This sweet snack is great for the creative baker and will be perfect to indulge upon yourself or to surprise your sweetie this Valentine’s Day season! Line your baking sheet with a layer of parchment paper. Fill the sauce pan with water in the medium sauce pan to a slight boil over medium heat. Once the water begins to boil, pour the semisweet chocolate chips into one of the mixing bowls. Place this bowl over the boiling pan to create a double boiler. The chocolate begins to melt rapidly, so begin stirring instantly after placing the glass bowl over the sauce pan to prevent burning. Once the chocolate is melted and smooth, remove the bowl from the sauce pan. Pour this melted mixture onto the parchment paper lined baking sheet trying to keep an even layer throughout. Place this layer into the refrigerator for 30 mins-1 hour to allow the chocolate to set. Remove from the refrigerator after this time, so the surface can become tacky and allow the two chocolate layers to stick to one another. Bring the water in the sauce pan to a boil again, and fill the second mixing bowl with the white chocolate chips. Turn the heat down and begin stirring instantly as white chocolate is more likely to seize up if heated too quickly at high temperatures. Once the white chocolate is melted and smooth, remove the bowl from the pan and add 2-3 drops of red food coloring. Stir thoroughly to spread the color throughout until it is a light pink. Too much food coloring will cause the white chocolate to seize and clump. Pour this melted white chocolate onto the chocolate layer on the parchment paper. 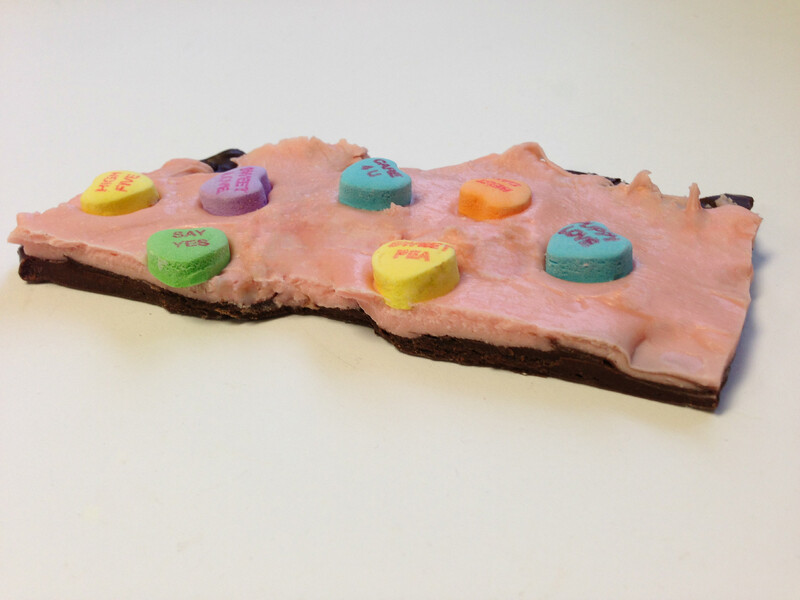 Quickly press in Sweethearts in any manner throughout this top layer and add any additional Valentine’s Day baking sprinkles you desire. Place the entire baking sheet back into the refrigerator for both layers to set completely for at least one hour. It is often best to leave it overnight. You will know when the chocolate has set as it will peel itself completely from the wax paper. Once this occurs, you can break the bark into as many pieces and different shapes as you like! Categories: Recipes, Valentine's Day | Tags: baking, candy, chocolate, chocolate layers, conversation hearts, dessert, family, food, NECCO, new england confectionery company, sweet snack, Sweethearts, sweets, white chocolate | Permalink. The season of love is upon us, and many of us are searching around for craft ideas which will help spread the loving spirit. 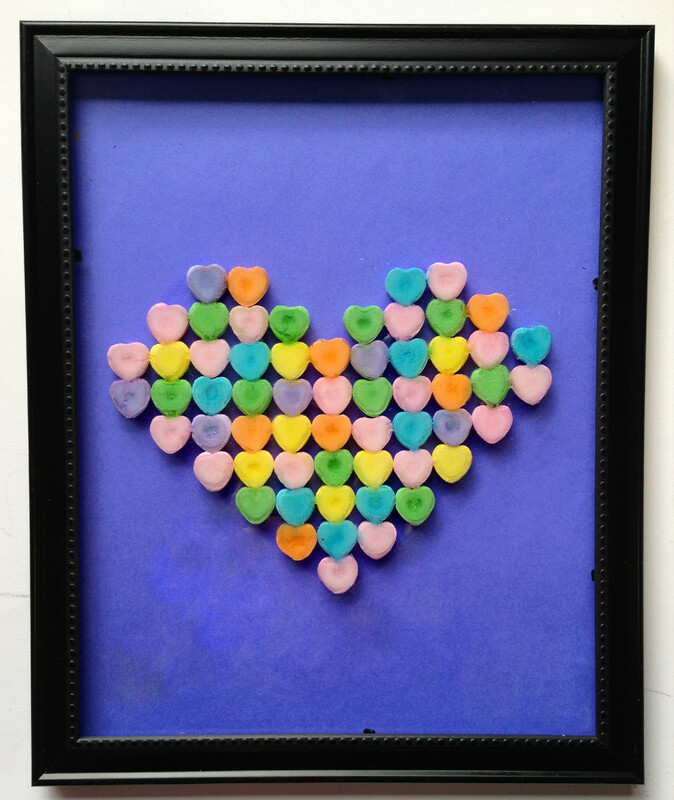 Today we bring to you a quick DIY project that both you and your little ones will love, using our legendary Sweethearts candies! 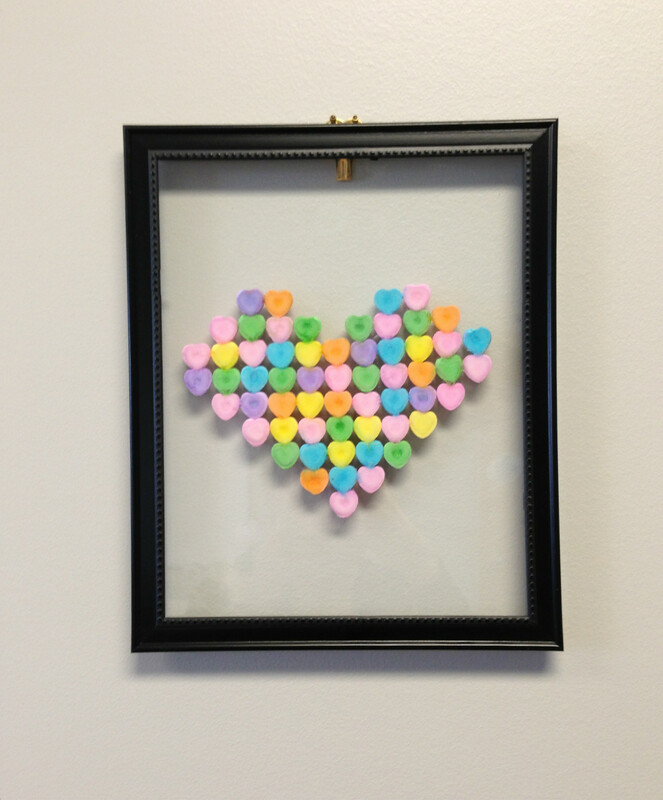 This craft is quick, easy and inexpensive to create! 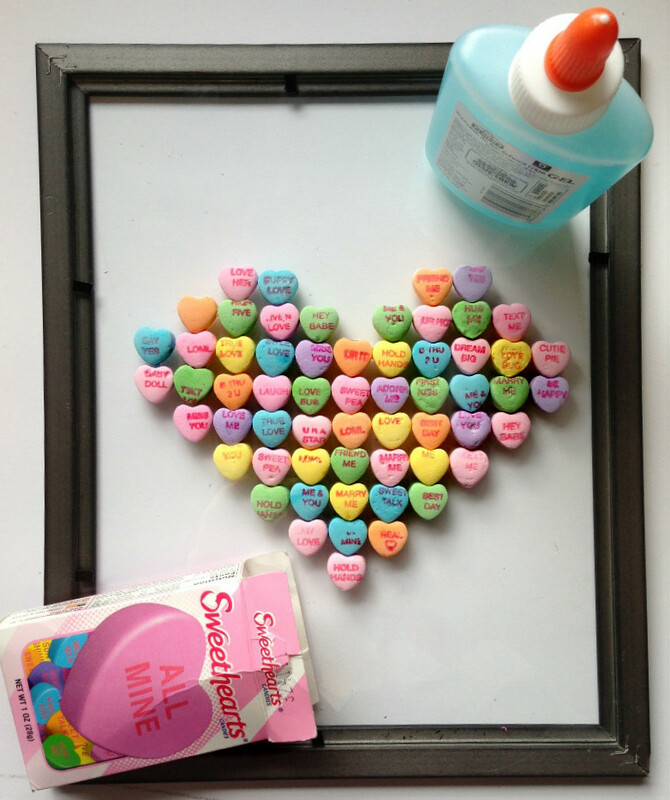 With a few supplies, you’ll be able to add a Sweet touch to your home for the Valentine’s Day season! Remove the back of the picture frame and place aside. You can choose to reapply it later if you wish. Flip the picture frame so that the open back is facing upwards and the glass is exposed. It is often best to wipe the glass free of dust prior to gluing! Take your Sweethearts and place them in tight lines, forming your heart shape. Make sure the text side of each candy is also facing upward. This step helps you keep your shape and spacing even throughout the gluing process. Carefully push the Sweetheart onto the glass and hold firmly for 5-10 seconds. Try not to move the candy around on the glass. However, it is okay if the glue spreads a little as it will dry clear and unnoticeable. Repeat Step 4 & 5 for each Sweetheart you have lined up in the heart formation. You can replace the back with colored construction paper or simply opt to hang it with no back and have the paint on your wall show through. 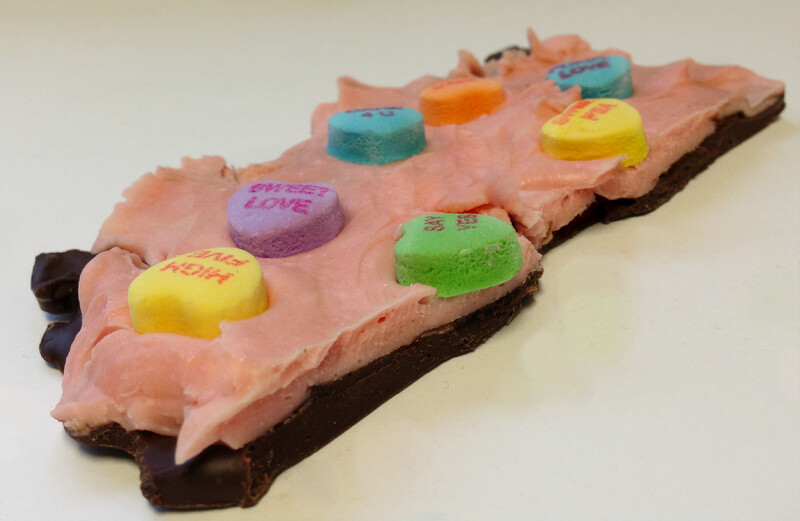 Categories: Crafts, MyNECCO, Valentine's Day | Tags: candy, conversation hearts, crafting, diy, home, love, NECCO, new england confectionery company, Sweethearts, valentine s day, Valentine's Day | Permalink. 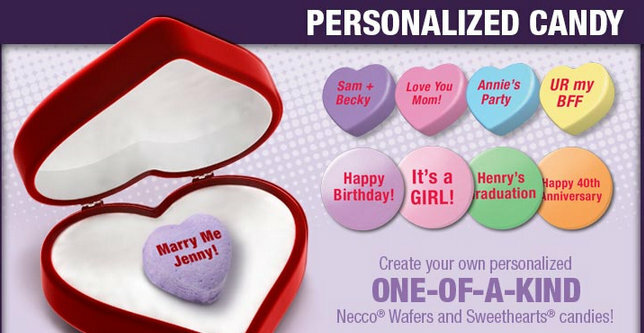 Personalize Valentine’s Day with MyNECCO.com! 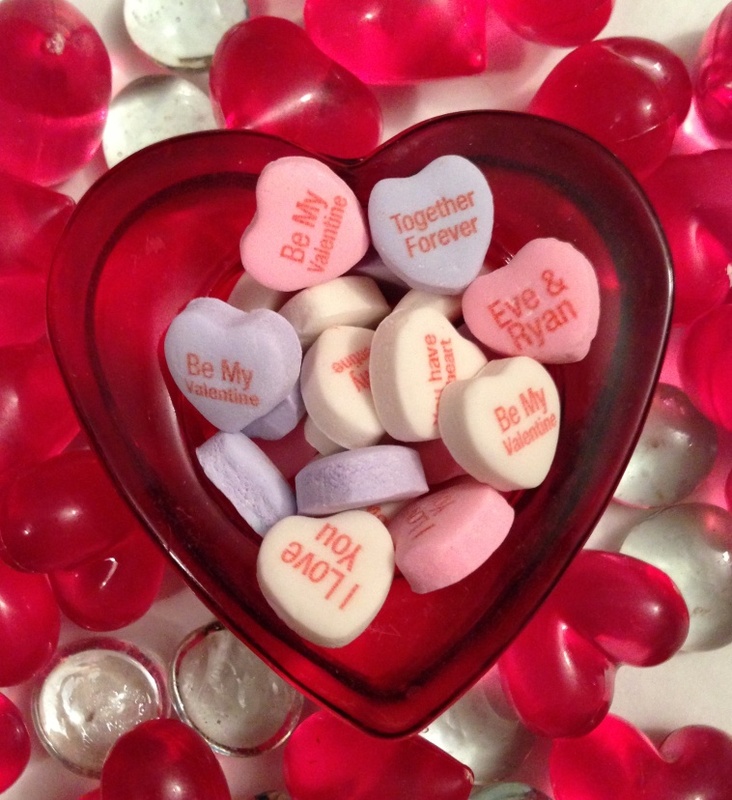 Make this Valentine’s Day truly special with customized candy from NECCO! 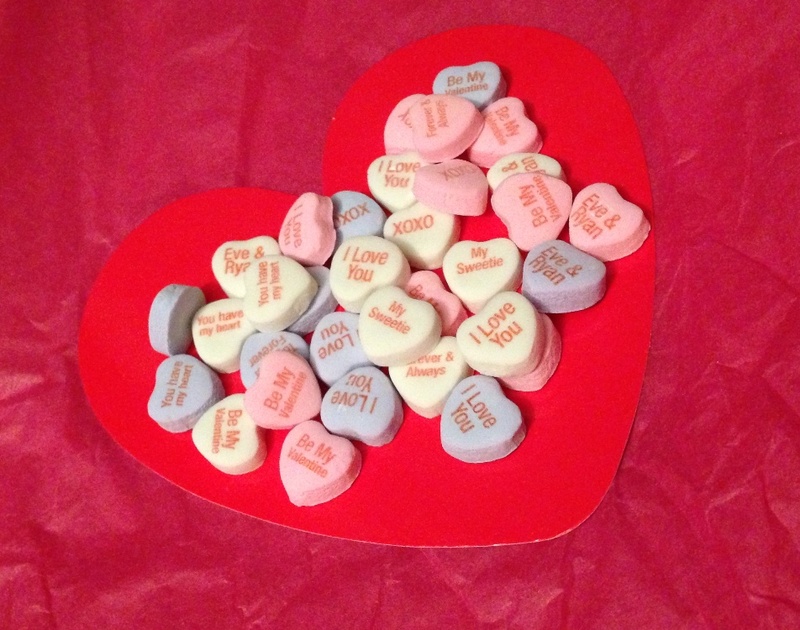 On our newly updated online store: MyNecco.com – you can now personalize Sweethearts and NECCO Wafers! Make this Valentine’s Day personal with customized Sweethearts, and tell your sweetie how special they are in your own words. Pick your flavors, choose your sayings and enjoy a truly unforgettable Valentine’s Day! Your phrases can be anything you desire- from names to memorable dates to sweet little personal messages that you and your loved one will cherish! These personalized candies will make the perfect sweet surprise for that someone special, and your custom text will be sure to touch their hearts. 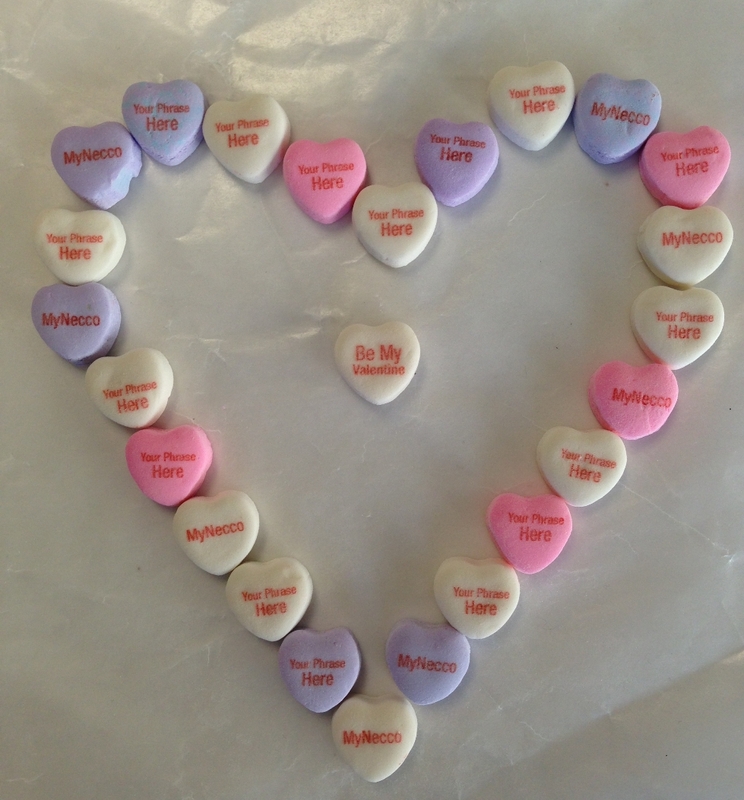 How will you make this Valentine’s Day extra special with MyNecco.com? Categories: MyNECCO, Valentine's Day | Tags: candy, couple, custom, date, gifts, holidays, love, MyNecco, NECCO, new england confectionery company, personalize, sweet, Sweethearts, sweetie, Valentine's Day, wedding | Permalink.